Learn more about the 2020FWD strategic framework. The University of Wisconsin System was created on October 11, 1971, by Chapter 100, Laws of 1971, which combined the two public university systems of the state under a single Board of Regents. The 1971 legislature set July 1, 1973, as the final date for completion of the merger, but 1973 Assembly Bill 930, drafted with the help of a Merger Implementation Study Committee to achieve that objective, did not pass in the assembly until the spring session of 1974 and died for lack of senate action when the regular session ended. The bill passed both houses, as Senate Bill 2, in the special session in May 1974 and became law on July 9, 1974. The bill combined the former Chapter 36 (former University of Wisconsin) and Chapter 37 (former Wisconsin State Universities) to create a new Chapter 36 (University of Wisconsin System) of the Wisconsin Statutes. Chapter 36 (www. legis.state.wi.us/statutes/Stat0036.pdf ) sets forth the mission and purpose of the University of Wisconsin System. This statute also describes: the responsibilities and powers of the Board of Regents, faculty and student roles in shared governance, faculty appointment and tenure rights, academic staff appointments, and other aspects involved in the administration of the University of Wisconsin System. The pre-merger University of Wisconsin was created by the state constitution and state law in 1848. At the time of merger in 1971, it consisted of the original land-grant university at Madison (1849); the University of Wisconsin–Milwaukee (merged in 1956); UW-Green Bay (1968) and UW-Parkside (1968) plus 10 freshman-sophomore centers (now branch campuses) and statewide Extension. Total 1971 enrollment was 69,554. Governance was by the Regents of the University of Wisconsin, a board of 10 members, nine appointed by the governor and confirmed by the senate for nine-year terms, the tenth being the state superintendent of public instruction who served ex-officio on both the UW and WSU boards. The Wisconsin State Universities system had its origins in an 1857 state law creating the Board of Regents of Normal Schools. The first of nine such institutions was opened at Platteville in 1866 and the last at Eau Claire in 1916. In 1927, the normal schools received authority to grant baccalaureate degrees in education and were renamed State Teachers Colleges. With the addition of liberal arts programs in 1951, they became the Wisconsin State Colleges. (As a side note, UW-Stout was founded as a private institution in 1893. It was governed by a separate Board of Trustees from 1911, when it became a state institution, until 1955 when it was designated part of the Wisconsin State Colleges System.) In 1964, the Wisconsin State Colleges were designated Wisconsin State Universities. At the time of merger in 1971, the board had 14 members, including the state superintendent of public instruction and 13 citizens appointed by the governor and confirmed by the senate for five-year terms. The WSU system, then governed by the board, consisted of the nine universities and four freshman-sophomore branch campuses and had a total enrollment of 64,148. The 1971 merger law was approved after long debate by a margin of one vote in the senate. It combined the two systems under a single Board of Regents. The current UW System consists of two doctoral campuses (Madison, Milwaukee); 11 comprehensive campuses (Eau Claire, Green Bay, La Crosse, Oshkosh, Parkside, Platteville, River Falls, Stevens Point, Stout, Superior and Whitewater); 13 branch campuses; and a statewide extension network with offices in every county. In 2018, the Higher Learning Commission approved a UW System restructuring proposal that aligned the 13 two-year UW Colleges campuses with seven of the comprehensive campuses. 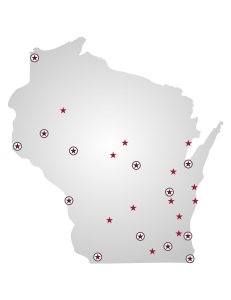 These are now called branch campuses (Eau Claire – Barron County; Fox Valley [a branch campus of Oshkosh]; Fond du Lac [a branch campus of Oshkosh]; Green Bay, Manitowoc Campus; Green Bay, Marinette Campus; Green Bay, Sheboygan Campus; Milwaukee at Washington County; Milwaukee at Waukesha; Platteville Baraboo Sauk County; Platteville Richland; Stevens Point at Wausau; Stevens Point at Marshfield; and Whitewater at Rock County). Each institution is named “University of Wisconsin–” followed by the location or name. With the Board of Regents, the UW System Administration leads and serves the UW System institutions, as a champion of higher education and a responsible steward of resources. Under the direction of the UW System President, the UW System Administration helps to develop, and then implements, monitors, and evaluates policies enacted by the Board of Regents, aligning university programs with the current and future needs of the state and the nation. Develops strategic plans, analyzing advances in teaching and learning, new technologies, and demographic trends. Acquires and manages the human, physical, and financial resources needed to advance public higher education in Wisconsin, advocating for UW System institutions, students, employees, and stakeholders. Ensures the effective and efficient use of resources, building trust with students, taxpayers, donors, and other funders. 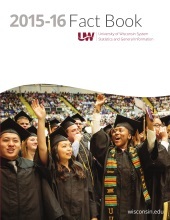 Measures, evaluates, and reports the UW System’s progress toward strategic goals and operational objectives, demonstrating accountability and leadership. Models and leads organizational learning and transformation through inclusive excellence, equity, and diversity, by engaging with students, faculty, staff, and a wide variety of external stakeholders, whose diverse viewpoints and experiences enrich the university’s impact. Facilitates close coordination and cooperation among the UW System institutions, building on existing capabilities and sharing expertise. Coordinates UW System activities and operations with appropriate local, state, and federal governmental agencies. Facilitates effective partnerships with other public and private educational institutions and systems, university governance groups, businesses, students, and others, to create shared solutions to emerging challenges. Interprets and applies laws, regulations, and business practices that govern the UW System, providing reliable guidance and oversight for the institutions. The Board of Regents of the University of Wisconsin System consists of 18 members, 16 of whom are appointed by the Governor subject to conﬁrmation by the Senate. Of these 16 members, 14 serve staggered, seven-year terms. Two UW System student members are appointed for staggered two-year terms; one is a nontraditional student. Members serve without pay. The state superintendent of public instruction and the president or a designee of the Wisconsin Technical College System Board serve as ex officio members of the board. The board is responsible for establishing policies and rules for governing the system, planning to meet future state needs for university education, setting admission standards and policies, reviewing and approving university budgets, and establishing the regulatory framework within which the individual units operate with the widest degree of autonomy within the controlling limits of systemwide policies and priorities established by the board. The regents hold eight regular meetings per year. The board appoints the president of the university system and the chancellors of the 13 universities. All serve at the pleasure of the board. The board grants tenure appointments to qualified faculty members. The board president, vice president, and other corporate officers are elected in June for one-year terms. The president of the board appoints members of the regents’ education; business and finance; audit; capital planning and budget; research, economic development, and innovation; personnel matters review; and student discipline and other student appeals committees, as well as special committees and external bodies. The regent executive committee consists of the president, vice president, chairs of five standing committees, most recent past president, and one other member appointed by the president. The president and chancellors of the University of Wisconsin System are charged with implementing regent policies and with administration of the institutions. The system administration, located in Madison, is responsible to the president of the system and assists the Board of Regents in establishing policies, reviewing the administration of such policies and planning the programmatic, financial and physical development of the system. As executive heads of their respective faculties and institutions, the chancellors are responsible for the administration of their units, including curriculum design; degree requirements; academic standards; grading systems; faculty appointments, evaluation, promotion and recommendations for tenure; and auxiliary services and budget management. On December 7, 2012, the Board of Regents adopted Regent Policy Document 20-20, under which university staff may participate in institutional governance. The Board stated that the purpose of the policy is as follows: “This policy enables active participation in the immediate decision-making and policy development of the institution. Active participation in governance for University Staff under this policy is not collective bargaining and will not result in a labor agreement or contract. University Staff may make recommendations, consider proposals, and raise concerns to institutional leadership.” The Board policy also provides that university staff shall have the right to structure themselves in a manner that they determine and to select their representatives to participate in institutional governance. Coordination of university and vocational-technical education programs is provided for by statute, making the president or his/her designee of each governing board an ex-officio member of the other board. In addition, the two boards have established a joint administrative committee to discuss collaboration and coordination in developing academic programs and in utilizing physical facilities. One major effort has been the development of the Transfer Information System (TIS). TIS is a computerized course equivalency and degree requirement matrix designed to provide students and staff with accurate, current and accessible information to assist students with decisions that will enable them to transfer into and between the UW System institutions and complete their degree programs without unnecessary delay. The counties and/or cities in which the branch campuses (formerly UW Colleges) are situated own and maintain the campuses, buildings, and facilities. Educational programs, equipment, and services are provided by the comprehensive universities they are affiliated with and the UW System. These branch campuses are important not only to the educational life of the communities they serve, but to their recreational and cultural life, as well. County UW-Extension offices are departments of county government. Wisconsin Statute 59.56, as passed in 1914 and amended over the years, permits county boards to establish and maintain an educational program in cooperation with University of Wisconsin–Extension. The county provides support for county-based educators. The county also provides adequate travel expenses, clerical support, office facilities and general supplies to meet the county programming needs. By statute, Extension agents (county-based educators) are employed with county, state and federal funds. Cooperative Extension will seek county input when filling vacant positions.